Scientists, in collaboration with CSISA, help farmers practice integrated disease management with the help of the weather-based Stempedia model. Stemphylium blight is one of the most damaging diseases that plagues lentil fields in South Asia, causing plants to shed leaves and loose twigs, ultimately leading to grain loss. In severe cases, yield losses as high as 90% have been reported in Bangladesh and other countries. Lentil production is an integral part of many nutrition-sensitive farming systems in the region, so Stemphylium blight is a threat to smallholder farmers’ livelihoods in Bangladesh, India and Nepal. Disease severity is conditioned by cloudy weather, relative humidity, and temperature and precipitation regimes. It may vary between locations within a growing season and also between seasons within a location. If foliar fungicides are carefully used in combination with a suite of integrated pest management practices, the disease can be controlled. However, farmers often find it difficult to determine the timing, frequency and amount of fungicide they should use. This requires special consideration because fungicides can affect yield and have negative environmental consequences if used improperly. The Stempedia model, a weather-based model used to assess the risks of Stemphylium blight disease, is being processed to help farmers decide when and how much fungicide to use to appropriately control Stemphylium blight. The Cereal Systems Initiative for South Asia (CSISA) has entered into a collaboration with the Climate Services for Resilient Development (CSRD) project, both supported by USAID/Washington, to enable national scientists and extension officers in Bangladesh, India and Nepal to test the Stempedia model and assess the regional and seasonal risks of Stemphylium blight occurring. Partner scientists and officers collect data in farmers’ fields, assess the severity of the problem and pass those data to CSRD for Stempedia model testing and calibration. The huge task of collecting field data would have been impossible without the collaboration between CSISA and CSRD. 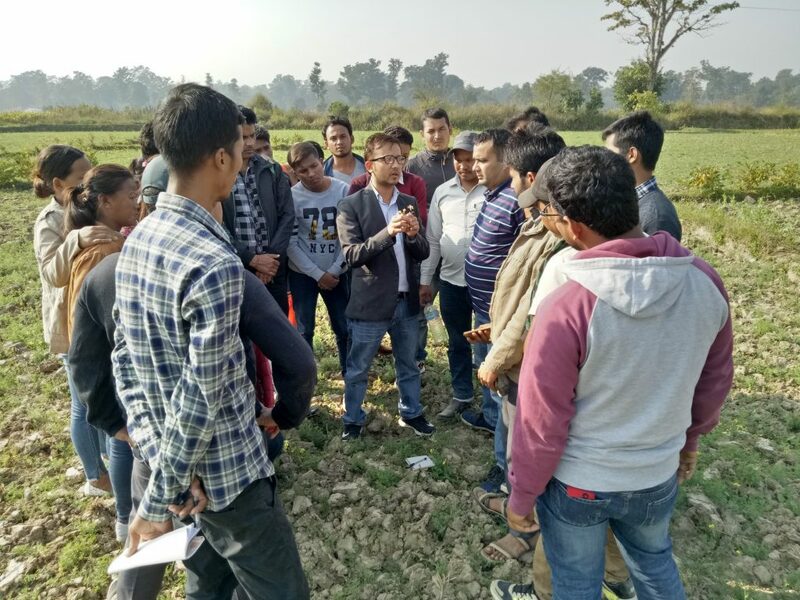 CSISA and CSRD mobilized national partners and collected data on the incidence and severity of Stemphylium blight during the 2017-18 growing season from 480 farmers’ fields in three countries: in Bangladesh with support from the Department of Agricultural Extension, in India with the help of Bihar Agricultural University, and in Nepal with the support of Nepal Agricultural Research Council’s National Grain Legume Research Program. The status of Stemphylium blight was assessed before harvest and the results indicated that it was more prevalent in the Bangladesh and Nepal sites than in the India sites. Relevant weather data, available from five sites, were used to run the Stempedia model, and preliminary results showed that the model had the potential to mimic the status of the disease observed in the fields. The Stempedia model is currently being calibrated to achieve prediction accuracy, and more data from a similar number of fields in the three countries are being collected in the 2018-19 growing season for comprehensive model refinement. The ultimate goal is to set up the model to analyze weather forecasts and train national extension partners to use Stempedia so they can better advise farmers. Speaking about the Stempedia model, Dr. Anurag Kumar of CSISA, Bihar, India, said, “Farmers in Bihar had no clue how to control the disease and had been blindly using chemicals for controlling Stemphylium blight. This model will guide farmers on when to use fungicides or whether to use them at all.” Once it is successfully calibrated and refined, the Stempedia model will be used to provide weekly early warnings on the risk of the disease. Based on the forecasts, national extension agencies will develop relevant advisories and extend them to farmers.